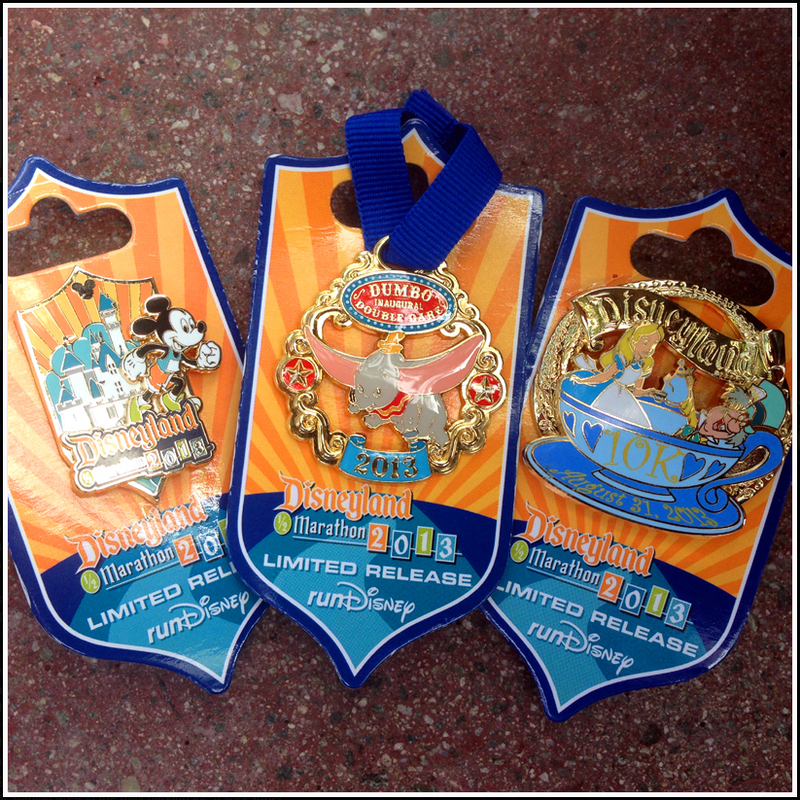 A runDisney race weekend is always non-stop with activity. I'm used to what goes down on the east coast, but Disneyland was a whole new animal for me. Getting ready to run the first event of the 2013 Disneyland Half Marathon weekend threw some curveballs my way, but dealing with them was something that I took in stride. 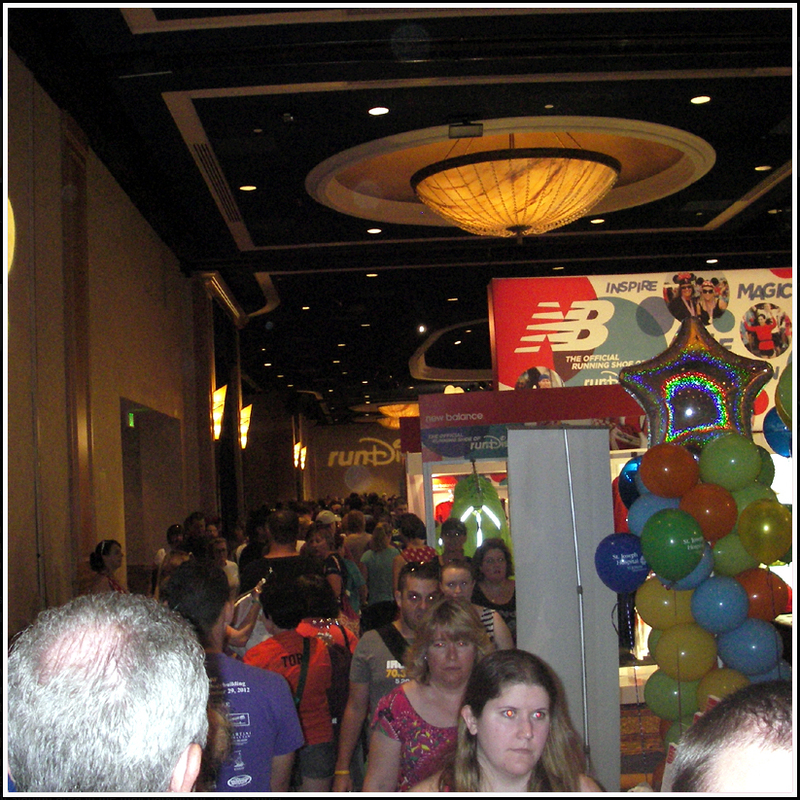 After leaving the runDisney meetup Friday morning, I was headed to rendezvous with my running partner at the Disneyland Hotel and Convention Center for the race expo. Karen was coming from our hotel to wait in line to first buy race merchandise and then pick up our race numbers. The expo opened for 10am, and we had heard that lines form early for entry. When I arrived at the expo soon after 9am, I found out that those rumors were more than accurate. Lines had already began to weave back and forth around and through the hotel in to the parking lot. I hurriedly got in line and texted Karen to let her know what was going down. At 10am the doors opened, and an organized line filed in to the convention space. What I found in the merchandise area was less than organized. Race participants and their families had swarmed the merch area and were grabbing any garment they could get their hands on in the size that they most closely thought they could fit. Many were grabbing multiple sizes of the same garment, and trying on the items on the expo floor. It was quite the spectacle, and had I not been there on a mission, I would have enjoyed sitting back to watch the runners in their natural habitat. I was armed with a list of merchandise items that I wanted (a pin and a keychain) and items that other friends who were arriving in Anaheim later in the day wanted. I was able to find a majority of those items pretty easily and get in line to check out. The line to checkout took another 45 minutes of standing and weaving, but I made friends with a group of ladies in line who also were east coasters running their first Disneyland race. We held each others' spots in line as we ran to use the restroom, get water, and reconsider a purchase or size. It was this camaraderie among runners that made the experience better than fighting the masses at a department store the day after Thanksgiving. One lesson could be learned from Black Friday and how its transformed in to an online endeavor. Why not send consumers to a website to purchase their memorabilia weeks before the event and ship it to them before they travel to the race? Just a thought to prevent expo mayhem. At this point in my adventure, Karen had arrived and made her way in to the expo. We decided it was time to head down to the parking garage a level below the convention center floor where number pickup was situated. Snagging my race bib was incredibly easy, getting my wristband for the Coast 2 Coast Challenge was complete, and picking up pre-ordered park tickets was turnkey. We were in and out of this area in minutes, and found all of the volunteers very knowledgeable and helpful. Shirts for the events were being distributed back up on the convention center floor. Karen and I both requested the same sized shirts, and there was a line to get those; however, the time was spent interacting with booths that had been set up as part of the expo. ABC Television was premiering multiple shows from their fall lineup and asking trivia questions to win prizes, the Anaheim Angels had a wheel to spin and win hats and bobbleheads, Minute Rice and other food vendors were giving out samples and coupons. The array of vendors was wide, and standing in line again went by quickly with all of the energy in the building. When we finally saw the shirts that had been designed for our races, we were thoroughly pleased. Because we were participating in the Dumbo Double Dare, we received a shirt for the 10K and Half Marathon, as well as the DDD shirt. 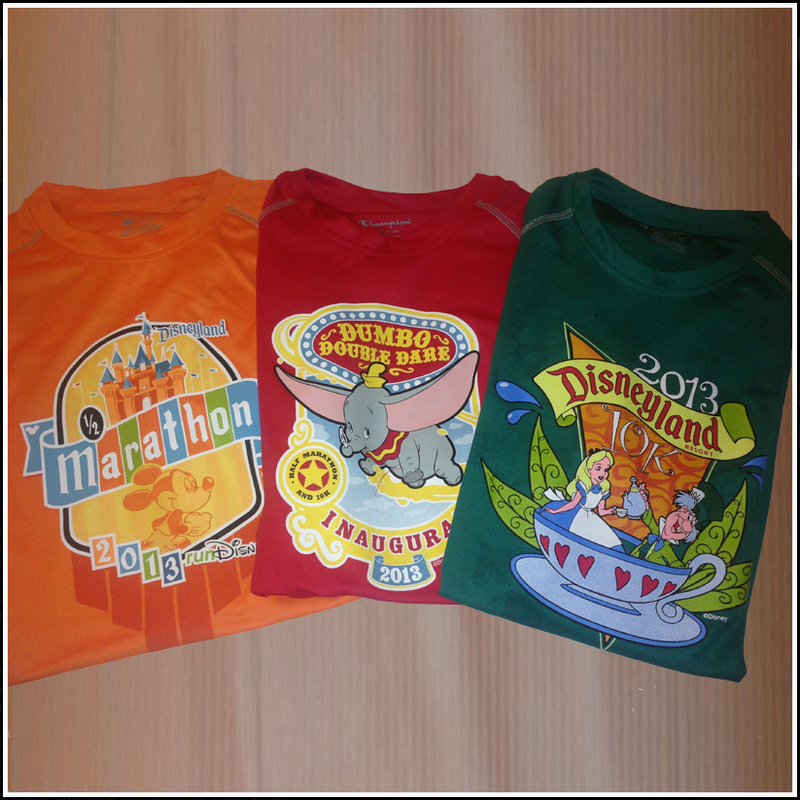 They're short sleeved and bright, but perfect with the iconic Disneyland race designs. You'll see me coming from a mile away, for more reasons than one. For the duration of the expo there is a speaker series on a stage with theatre style seating. Hosted by the effervescent Carissa (who also MC's the race start and finish lines), speakers that range from celebrities to running experts motivate and inspire race participants during 30-45 minutes sessions. Ali Vincent, the first female winner of The Biggest Loser, was on hand to speak along side running legend Jeff Galloway. Its an eclectic mix of speakers with something to offer for everyone. I was able to overhear some of the speakers while in various lines, but it was a goal to get off my feet ASAP with 19.3 miles looming over the next two days. After the expo we headed to a nearby resort restaurant, grabbed some lunch, and trekked back to the hotel for me to shower and change. I had been up since 4am for the meetup, and was still pretty gross from the fun run that we did that morning. 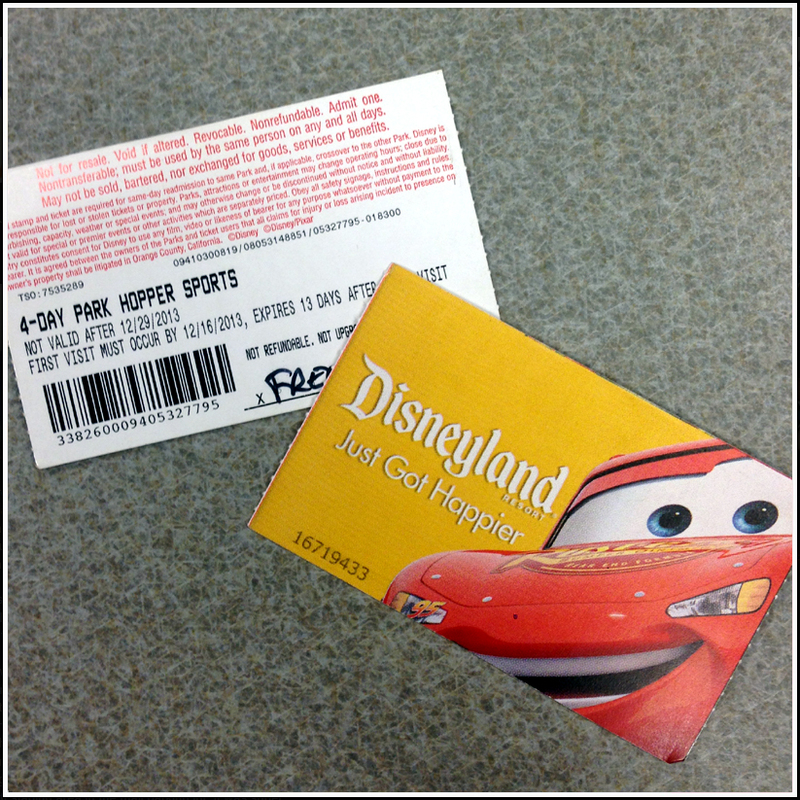 With a 4-Day park ticket in my pocket, I was ready to spend some time riding a few rides and resting up before we tackled the task at hand.